Imperial magnificence can be like ice cream – wonderful, but at some point you just can’t face another dollop of Baroque architecture, even if it does come with Rococo sprinklings. Vienna’s Museumsquartier (Museum Quarter or MQ) is the hummus and organic celery option. Opened in 2001, the Museumsquartier is modern, alternative, urban, and home to some pretty impressive art museums…a place of vibrant culture, a place to relax, a place to wonder what the artist was smoking when he came up with THAT idea. The site was once the Habsburgs’ stables, built in the early 18th century and housing hundreds of animals and dozens of coaches and carriages. The architect responsible – Fischer von Erlach – also designed Schönbrunn Palace. On a dark, moonless night, you might still pick up the scent of a stallion and the whispered commands of an imperial groom. Or not. The MQ Point (info centre and shop at the main entrance) sells discounted combination tickets. An “MQ Art Ticket”, for example, covers those three main sites and costs €26 at the time of writing. Subway: travel to the “Museumsquartier” stop on the U2 line. 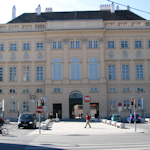 The MQ is quite big, so is also adjacent to the “Volkstheater” stop on the U2 and U3 lines. There are various entrances, but the three main ones are marked on the map below. Tram/bus: the 49 tram and 48A bus stop at Volkstheater. Other close-by stops are Getriedemarkt (bus 57A) and Ring/Volkstheater (trams 1, 2, D and 71). There’s an underground car park just in front of the MQ: a reasonably-priced Contipark Parkgarage.